In the News (from YouTube): “Global warming takes our planet into darkness, American scientists believe. The scientists analyzed satellite images that showed how the Earth was changing over time. Having compared the data, the scientists discovered a frightening trend. With every year, the globe loses the ability to reflect light. “The melting of ice in the Arctic reveals dark surface – water and soil. The dark surface reflects light a lot worse, but the heat absorption is larger. Question: How does a person clarify that the Creator really helps him? Answer: A person discovers that the Creator helps him in every state he finds himself in, both the good and the bad. Of course, he doesn’t understand this immediately. But what’s important is that he discovers that the Creator is also part of all his clarifications and his decisions, all his thoughts and of all his apparent mistakes. All this was prepared and arranged from Above. There is one point of something from nothing which the Creator created. Nothing other than that was created, and now the Creator reveals Himself with regard to the point of something from nothing. It turns out that the Creator must devote Himself to the point of something from nothing so that it will be like Him, that it will reach the same understanding, the same recognition, and the same feeling, which means that it will know Him fully. To the extent that this point reveals the Creator’s plan, it ascends all the 125 levels. This work is fulfilled by a person’s incorporation in the group, and the main outcome of this work is the attainment of the uniqueness of the Upper Force that has prepared our whole way and what we feel along that way. These are all the phases of spiritual attainment, all the manners of attaining the depth of the thought of creation. We reveal the thought of creation in every phase. This is the main point from which the Creator approaches us. A person may also reveal states that preceded his creation in the thought of creation. What Can We Add To The Creator’s Work? Question: In our small group there is a respectful attitude towards each other. How much should we maintain all of the conditions: paying Maaser, studying at the Education Center, and so forth? Answer: Paying Maaser does not apply to groups. If there is a solo student who is learning together with us, let’s say in Chukotka or Hawaii, it doesn’t matter where, we try to create an atmosphere for him in which he can develop like an embryo in his mother’s uterus. We try to create an incubator for him with all the technical methods, with all of our possible ways and means. If he wants to come closer to us, he must consider us as his group. We organize a focus group for him, supply the broadcast of lessons and workshops, and translate them into all languages. At the time of a regular lesson, 50 people work with us for the sake of those who are scattered all over the world, including you. If a person wants to advance, he must share in the life of the whole world group, support its existence, and help it. Paying Maaser goes to upkeep all aspects of the building, which costs a lot of money, and to provide a minimum salary to those who work full-time in dissemination (our salaries are much less than the average salary in the country). Therefore everyone must invest their part in this work. We consider a person to be a friend of the group if a person participates seriously. This is someone who is present for the lessons, pays Maaser, and engages in dissemination; it makes no difference if this is a single person, a small group, or a large one. Maaser is something very important, and this idea is not just financial. In the Torah it is written very simply: pay 10% because you cannot correct this part. The Upper Light will correct all the rest. And if you don’t give this 10% because it is very difficult to tear it from yourself, then you’ll waste it on all kinds of nonsense, which you are attracted to by your ego. This is referring to spiritual correction; that is why it is so difficult for us to pay Maaser. Open The Doors Widely For Everyone! Question: How do we connect the two expressions: “commandments that don’t need an intention” and a “commandment without an intention” is like a body without a soul? Answer: “Implementation of the commandments does not require an intention” refers to the fact that even when we don’t have an intention of in order to bestow yet, we still try to connect with the friends and that brings us to the right intention of love and bestowal. An intention of in order to bestow means that I focus on you and I want to fill you. A person in this world has no such intention. We are born without it, live our lives, and then reach the group. This means that the commandment doesn’t need an intention, so start the way you are. Even if you have an intention, it is only for yourself and not for anything else (this is how you were brought to the wisdom of Kabbalah). So, study and you will succeed. Suppose we have two levels of energy. The lower level is the intention of in order to receive that lacks the intention to bestow. There is a phase of preparation (Achan) for the intention of in order to bestow between this level and the next one, and then there is a Machsom (barrier that separates us from the upper world). Above the Machsom, we discover the intention that is external to me, or to bestow, the attribute of Bina, the Light of Hassadim (charity). 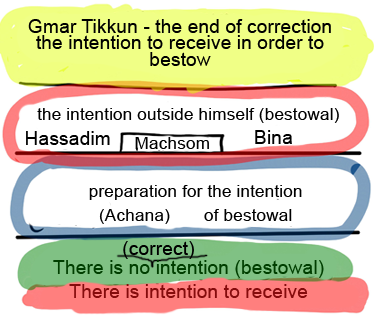 Then, there is the intention of to receive in order to bestow, or the Light of Hochma, and there is the end of correction (Gmar Tikkun). First, we are on the lowest level on which we have a normal healthy desire to receive in order to enjoy. Gradually, we come to the recognition that we have no intention to bestow. A person decides, “I must start changing myself,” and so he reaches the phase of the very serious preparation for the intention of in order to bestow called the time of preparation (Zman Achan). This very hard work may take months and even years. Gradually, under the influence of the Upper Light, a person reaches the intention of bestowal outside of himself. At the same time, he doesn’t give anything but simply exists as an embryo (Ubar). He adheres to the upper and annuls himself like an embryo, or like a small child with regard to a grownup, without interfering with his growth as he allows the upper to do whatever is necessary with him: “Do whatever you want with me; I agree to everything,” and this is aimed against his growing ego. When he completes the correction of all his desires, he ascends to the last level where he can receive pleasure in order to bestow for the sake of the Creator. This is a very high level, and we want to attain it by performing and completing all the corrections. Question: What constitutes a request for the middle line, asking for the right line to be stronger than the left? In the right line, there is no perceivable lack. The right line is perfection, gratitude, “whiteness,” and mercy. However, because the left line breaks through, I feel a lack and the need to augment the right line. The problem is when I move from the left line to the right, the left line grows even more! I increase the right line again, and the left grows once more. Ultimately, I clarify through this work in the two lines that there exists a notion of the middle line that allows one to use the left and right lines correctly, despite their oppositeness. Due to the fact that they contradict each other, I have the possibility to build them one above the other, without canceling either one of them. I do not choose one in order to erase the other, but instead, I begin to value the left line as well, since it is due to the left line that we have the ability to build the right. I also begin to value the right line even more, seeing its dissimilarity from the left. Both of these lines help me, gradually forming within me the respect for each of them. I see that, indeed, there is no evil in this entire governance. It is precisely this polar oppositeness that gives me the ability to open my eyes. Until then, I had a very narrow perception, either from one side or from the other. I did not see anything other than this world. If, however, I balance darkness and light in order to perceive them as equal, by this I open a new channel for myself. The middle line is something new. It is neither the left nor the right line as we currently can imagine. It is impossible to imagine the middle line. It is an entrance onto that straight beam that starts in this world and ends in the world of Infinity. The middle line refers to Adam, Zeir Anpin. This is the form of a corrected desire. Thus, due to the transitions from right to left and back to the right, I begin to value both lines, seeing how they sustain each other. I also see how useful it is for me to be in the left line relative to the right, and in the right line relative to the left. In other words, I bring them both closer and do not leave either one of them. I begin to relate to the left line the same way as to the right. Previously, I wanted to fill my desire to enjoy, but now I agree to leave it empty, without fulfillment, in the dark. This gives me different colors, shades, and qualities, without which I could not reach gratitude, the state of true bestowal. This is how I attain the middle line. Although the left and the right lines contradict each other, I still perceive them as equal, sublime, special, and necessary in equal measure. Therefore, precisely due to them both, I leave my egoistic attitude in which I valued one more and the other less. After all, what, in essence, can be given to me only by the right line and the state of absolute mercy (Hafetz Hesed), perfection in a state where I have nothing? We still need to clarify many nuances pertaining to these concepts, but we are already very close to the third line. Where Does A Human Being Begin? I Want To Be Like The Upper! Question: How do GE of the lower and AHP of the upper connect? Answer: It is when they are on the same level, one inside the other. AHP of the upper descends to GE of the lower and enters it. When the lower wants to connect to the upper, it must enter AHP of the upper with his GE. Once AHP of the upper is in GE of the lower, and another time, GE of the lower is in AHP of the upper; everything depends on who controls the state and who determines it. If I am the upper, I descend to GE of the lower, and so I want to enter it and know what happens to it and feel its deficiencies. So, I descend into it and am in its internality. If the lower wants to adhere to me with its upper part, its GE, it enters my AHP. Everything depends on the type of work between the upper and the lower that we refer to. They always adhere to each other by equivalence of form, but this equivalence can stem from the upper with regard to the lower or from the lower with regard to the upper. The upper diminishes itself, wanting to feel exactly what the lower wants, and so it enters the lower. The lower says, “The upper is so big! I want to be like it, and I totally annul myself just to be in it! I am ready to drown inside the upper so that the upper will swallow me!” This means that GE of the lower enters AHP of the upper. If the lower connects to the upper this way, the upper ascends and takes the lower with it. It is because they become one whole, and the Upper Light that operates on that level operates on both of them. If the lower wants to adhere to the Upper, he perceives the darkness that he sees in the Upper as perfection. Otherwise, he holds onto the Upper for his own egoistic benefit. So, he must see the opposite, that the Upper has nothing and he still desires the Upper’s form! We are talking about the levels of bestowal that are revealed on top of our ego and that are opposite to it. Therefore, I see that the Upper is increasingly more abhorrent for my ego, but I must overcome this feeling and perceive that it is nice. This means that I must try and see the group in the state of the end of correction, although I find flaws in it according to my flaws. However, I approach it in faith above reason and ask that all my repulsions and rejections will be turned into love and appreciation. Faith above reason is my spiritual vessel, and there is no other vessel. I must accept this contempt,hatred, the fear that I feel toward the Upper’s form as the greatest feeling of awe since this is the way the attribute of bestowal is perceived in my feelings. I am not aware that this is the attribute of bestowal. I feel that it is something hateful and intolerable. Then, it is time for a prayer since the only way I can adhere to AHP of the Upper is against my own will. The taste of the Upper disgusts me and I don’t want to connect and cannot since it repulses every fiber of my soul, and I feel that I would rather die than that. However, the Upper Light enables me to perform actions that are against my will. I change by the influence of the Light, and I begin to see that the Upper is nice. It isn’t because my taste has changed, like fashion changes and what previously seemed ugly suddenly becomes fashionable and desired. It turns out that I simply change my ego. Therefore, faith above reason is necessary here. I adhere to the Upper not because my reason has changed, and I suddenly see it as wonderful and beloved. The inner hatred I feel for it remains, and above it I feel love and appreciation now. These two opposite feelings are burning inside me. I understand that the Upper is opposite to me and that I am far from His attributes, which repulse me. At the same time, I establish a new attitude toward Him with the help of the Light that Reforms. Faith above reason means that I establish a new vessel in my state, adhesion with the group, in which I receive the new level. My feelings become 620 times stronger in this new vessel than in my own reason. Then, when I attain the next level with this vessel of faith, my reason suddenly grows by 620 times, too! Thus, I constantly swing from side to side more strongly each time by expanding the distance between the right and the left lines like a cone. Question: How does the group help the individual see the uniqueness of the upper force if there are many opinions in the group and everyone hears the teacher differently, and it is hard to come to an agreement even about the main values? Answer: You have all heard about the Talmud, but not everyone knows that it is a Kabbalistic book that explains in great detail the different laws that a person must keep in order to reach adhesion with the Creator. This book was written by great Kabbalists, and it is all in the form of debates and discussions. One says one thing, and another says something else, as if ten people had gathered in one room and they argue continuously with one another. However, a person who knows the material understands that they all speak about the same thing and that they all have attained spirituality. However, each one expresses his own nature. In our nature, there are at least ten positions from which one can look at the same thing and thus see the same concept in his own individual way. It isn’t just a debate about who is right but about mutual incorporation, a combination of all the views. Thus, they become more connected as a result of this study, although it seems that they argue with one another. As a result of this connection, they reach unity. Of course, you always will feel that you are different from one another in the group. If you accept this impression, it means that you don’t think and don’t feel what you argue about exactly since every person is different. It isn’t by chance that it is said, “Just as their faces differ, so do their opinions differ.” There is nothing we can do about it. However, is it desirable that everyone thinks the same way? What will work on them? It will be like identical screws or identical stones and not human beings. Every person must be unique. In fact, the more developed a person is, the more different he is from others. We must connect on top of all the differences since it is actually thanks to our connection above the differences that we attain unity. It is the way each one expresses a characteristic quality, and when they are all mutually incorporated, we establish the general collective one. This “one” doesn’t exist by itself; we must build it. This is the reason for the shattering. There was no feeling of the one in the world of (Infinity). There was no one who could feel this one. However, when the worlds descended after the shattering and falling into this world, everyone turned out to be different. Thanks to the fact that we are all different but we connect above our differences, we begin to establish the concept of the one, which doesn’t exist by itself. So, it is only natural, right, and good that there are debates in the group. The question is how we perceive them and use them in order to reach unity among us. In our unity, we discover the uniqueness of the upper force who is One.